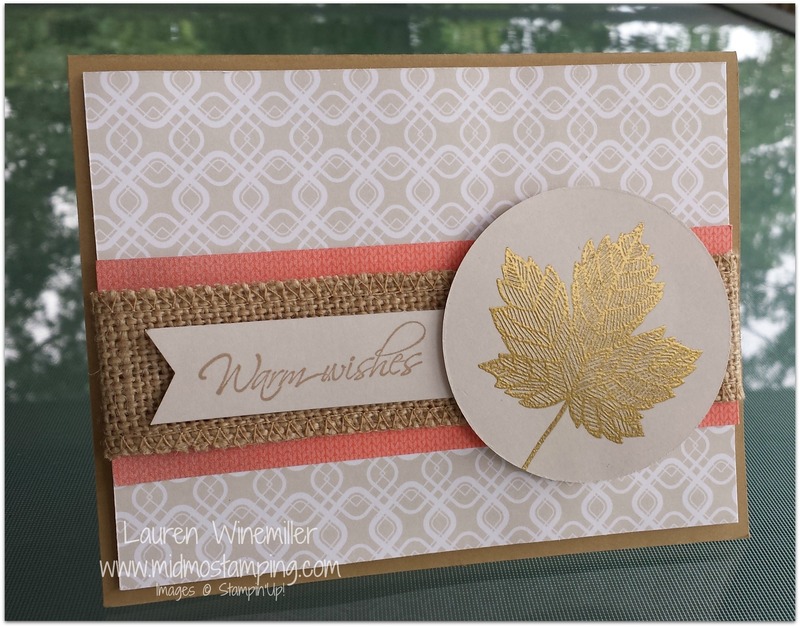 I know it’s crazy to be sharing fall cards when it’s still August, but I couldn’t wait to use the NEW Burlap Ribbon and Magnificent Maple stamp from the NEW Holiday Catalog! For example, you’ll notice the background paper looks pretty similar to the place card. I simply trimmed it to 4″ x 5-1/4″ to fit on my Baked Brown Sugar card base. When you turn the pattern side over, you have this great neutral color to work with too! I used it to stamp my Magnificent Maple leaf and greeting. 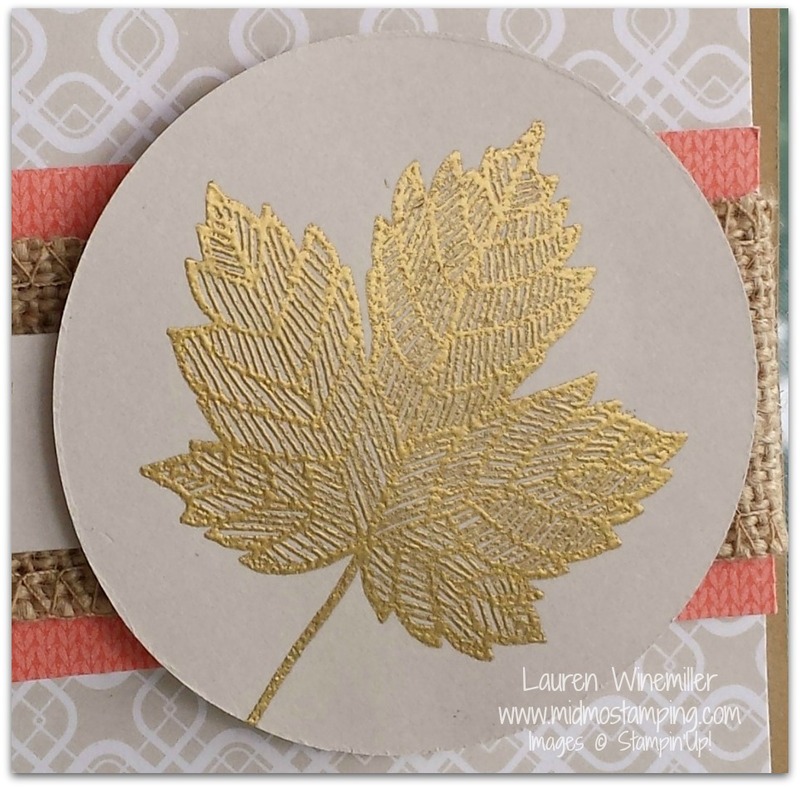 The maple leaf was stamped in Versamark and embossed with Gold Embossing Powder using the Heat Tool. I LOVE how it picks up the little details in the leaf! You might also recognize the long strip of tangerine tango designer series paper that made it on to my card. You guessed it– from the Tablescape kit! The burlap ribbon was wrapped around the card front and secured in the back with scotch tape (the snail adhesive wasn’t quite strong enough). You could also use a little sticky strip if you have some on hand. Hope your week is off to a great start! Have a Fabulous Day and Happy Stamping! 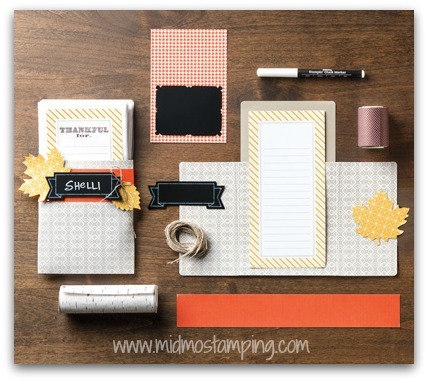 NEW Stamp Set of the Month Class on Friday, September 6th — Sign up HERE!